When I started designed sheet metal parts and the tooling to make, the best technology available to use was a good mechanical pencil and electric eraser. Time has moved us forward into the world where we now model parts instead of drawing parts. Sheet metal model of formed open end louvers. These model parts exist in 3-dimensions and we can manipulate them any way we choose. We create assemblies from the modeled components. We can verify all aspects of the fit and functions of each component and the assemblies through animations to show how it will function in use. All this can be done before manufacturing. The models can be used in manufacturing to develop fixtures and programs because they present the actual part in 3 dimensions. Models do have a significant drawback as they don’t generally communicate dimensions, tolerances and design intent. For that we still need to make a drawing to show critical features, dimensional relationship and tolerances needed to verify the fit and function of the part. The drawing contains the information needed to inspect the finished part and verify it is correct. Models are a powerful tool to design and manufacture products in our high tech world but dimension and tolerances, much like those I put on vellum with my trusty pencil and lettering template, are still a critical part of the process. 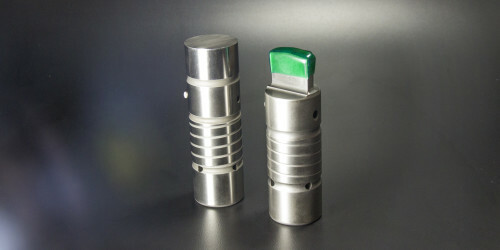 Dennis Lowry is the Custom Engineering Manager at Mate Precision Tooling.